Hannah attended music college from the age of 12 and received her BA and MA from the Guildhall School of Music & Drama. 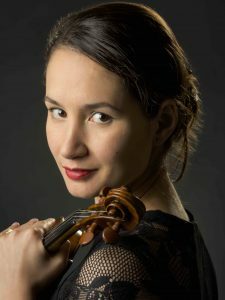 As a soloist, she won 2nd prize in the National Dutch Violin Competition for the under 17s, performed Mozart, Mendelssohn and Tchaikovsky violin concerti, and was live on Dutch national radio and television. She was a member of the Orion Trio, winning prizes at the Princess Christina Competition and the international Charles Hennen Competition. She gave recitals for the illustrious Canal Festival Amsterdam. Hannah plays a Montagnana/Cerutti violin, 1740/1880. Tom read Music at the University of Bristol, majoring in piano performance, before continuing his studies with an MMus at Royal Holloway, writing his final dissertation on the harmonic language of Rachmaninov. From 2006, Tom worked at Marlborough School, Woodstock, where he led the choir on foreign trips. In addition to performing with Hannah, Tom teaches piano at Oxford High, Kingham Hill and Stowe. He is also the Director of Music of St Martin’s Church, Bladon. In June 2016 Tom made his debut as a soloist in Mozart’s Concerto No. 13 in C major.